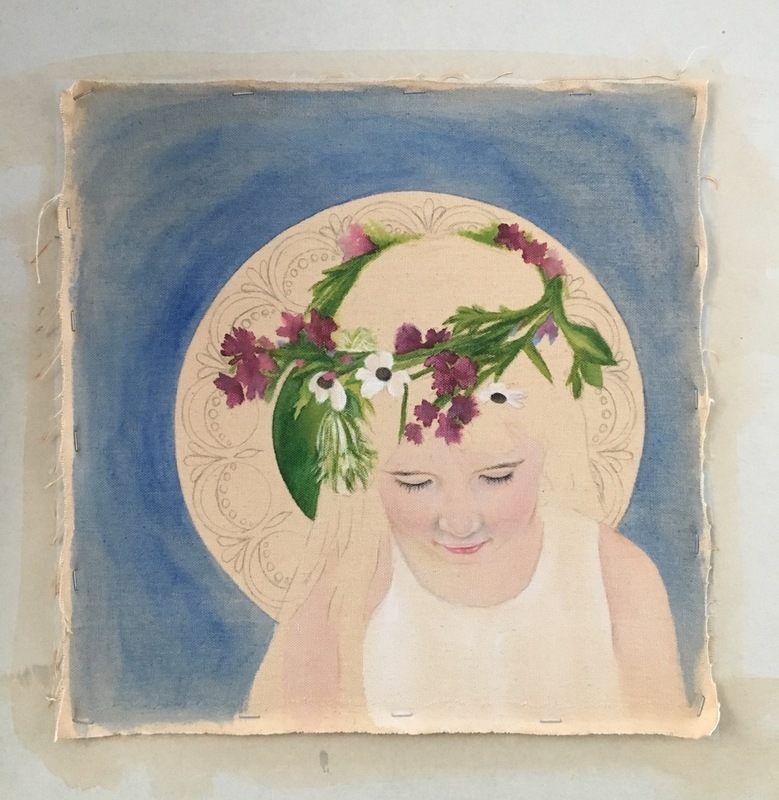 Recently, I had someone reach out to me about doing a commissioned painting that she would give to her older sister for her birthday. She shared some photos with me from her childhood and she wanted to capture this moment in time from when they were children. She had fond memories of her older sister draping both of them in fabrics to play "dress up." This photo was the only remnant that she had from that memory. She also gave me some clearer photos to work from to capture their likeness so I combined the photos to make the finished product. In the radial design around the older sister I used her name, "Charlotte" to form the design. I have done this before with my art students but have never done it in my own work before. Her name is flipped and mirrored in every other section. 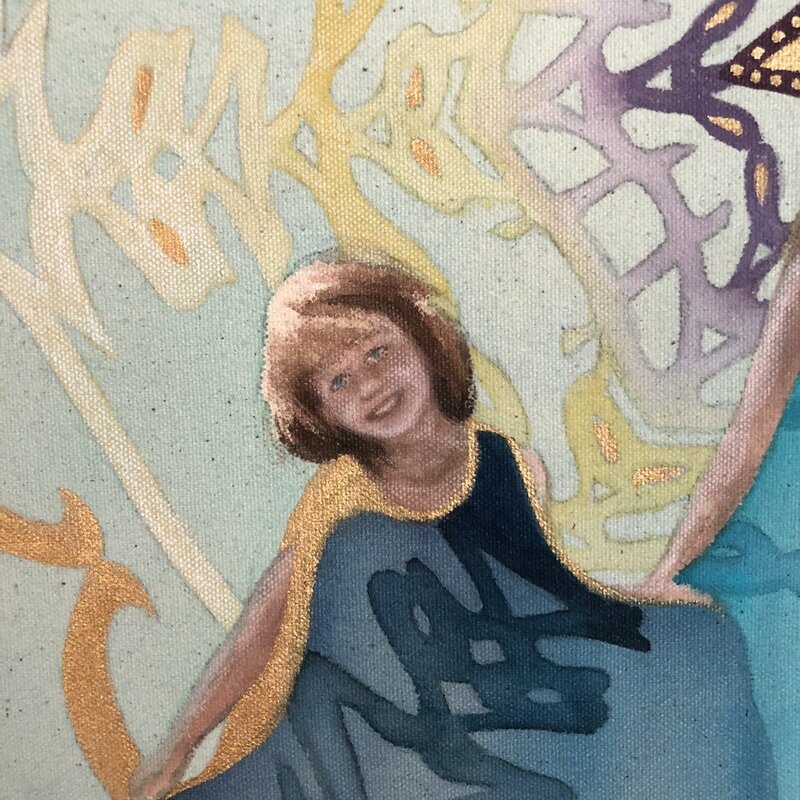 Look directly under the peacock, start at the gold "C" and read the name all the way to across to the purple "E." It was fun to make the name into a hidden element in the painting and it was really fun to watch my client and her sister try to find it! I took this photo of them when this baby was about a month old. The fact that she was a first time mother made this moment I captured even more special. I worked in my medium of a mixture of fluid acrylics and colored pencil on canvas. Layer upon layer, and wash upon wash, I developed this painting and brought it to a soft and dreamy place. For this custom painting, she requested blues and greens along with hydrangeas. I incorporated hydrangeas in a more subtle abstract way in the background which gave some depth and texture to the painting. I snuck in some bird silhouettes and added some touches of gold, of course. These are two signature elements I feel MUST be included in the portraits that I do ;) I played around with the composition with this painting and placed the mother and baby off center and coming out of the corner. I was pleased with how it turned out and I can't wait to do more! I am taking orders for mother and baby portraits, but these orders will not be started until 2017. To place your order email me at taratories@gmail.com or click HERE. 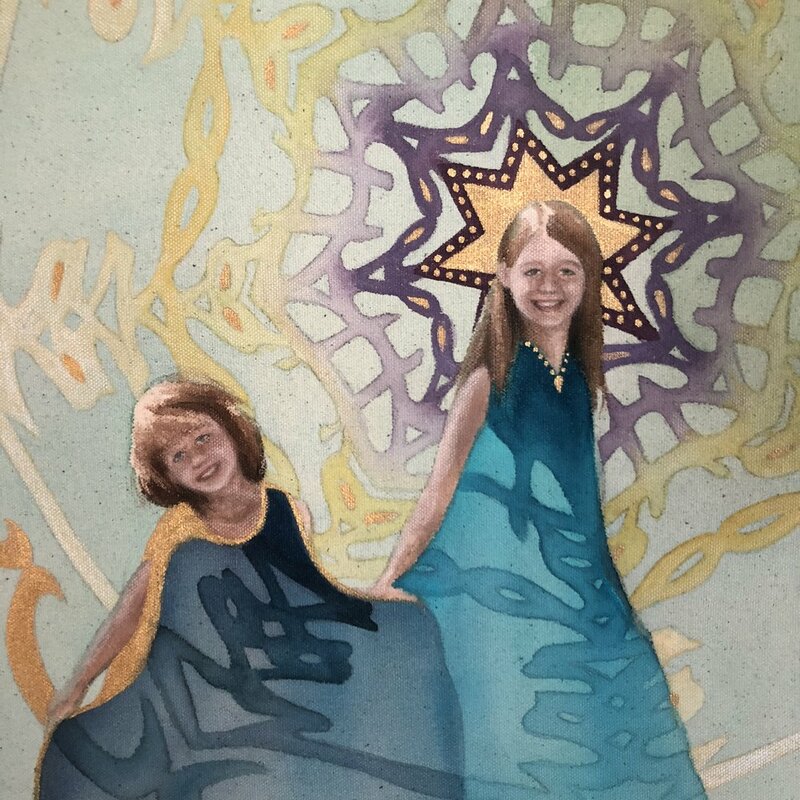 Recently I had the pleasure of doing a pair of commissioned portraits for someone of her two daughters. 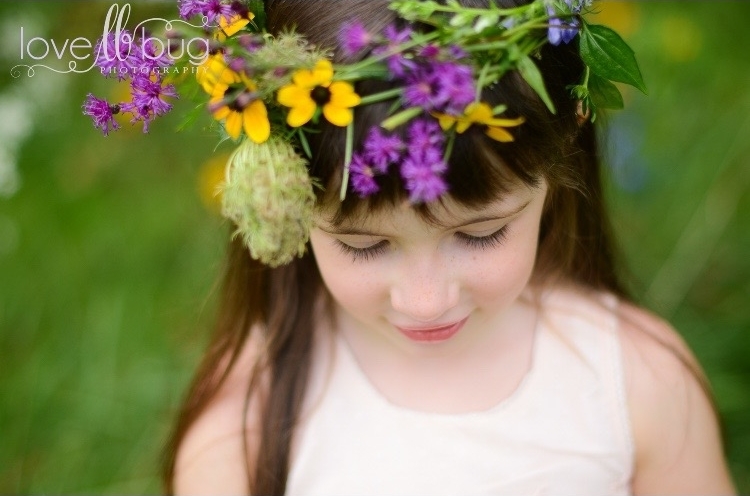 The person that had me do the portraits is the photographer of Luv Bug Photography . What a gift it was to have gorgeous photos to work with! The reason I changed the flowers on this photo was to coordinate with a family picture of theirs. The second photo was just as dreamy as the first and really portrayed the true essence of childhood. I contemplated how I was going to paint her straw hat, and keeping the color of the canvas as the main color was my solution. I just added the shadows and highlights to it with paint and pencil. I had a variety of ideas of how I was going to incorporate designs into this one, but I just felt that any designs added was going to take away from all that was going on. I decided to just add some gold dots on some of the leaves to give the painting a little extra something and I'm really happy with how it turned out. Sometimes less is more. I had the pleasure of hand delivering these little 10X10 paintings to my client on her birthday! I felt so honored that she chose paintings from me as her birthday present to herself. Please feel free to contact me through my website or email me at taratories@gmail.com if you are interested in a custom portrait for you or someone else. Recently I did a commissioned painting for a man who lost his daughter to cancer this past year. In this photo there is a father sharing a sweet moment with his daughter who was battling cancer at the time that this was taken. He is a photographer and normally is behind the lense, but for this brief moment he was the one captured on film instead. Using my typical circular designs, I framed the faces and sketched in the placement of everything on my canvas. 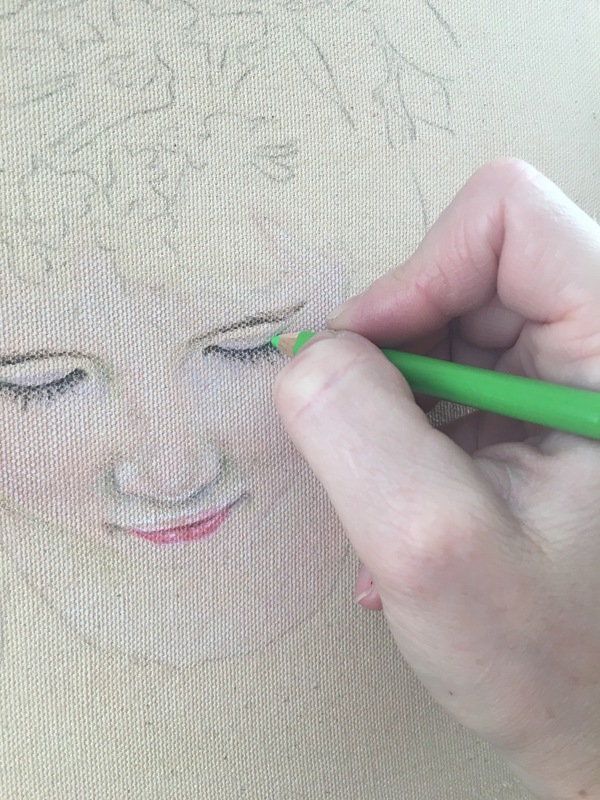 I began layering skin tones first with my paint and colored pencils. I developed his face first and then moved on to hers. The joy captured in their expressions in this moment in time was so touching. Changing the color of his shirt helped me go with a monochromatic and more subdued color palette. The shadow where there heads are touching really became an important element of this painting because it gave some important depth and contrast. After searching and searching for the perfect flower to include in this piece, I stumbled across the "bleeding heart" flower and right away knew this was the perfect choice because of its symbolism. 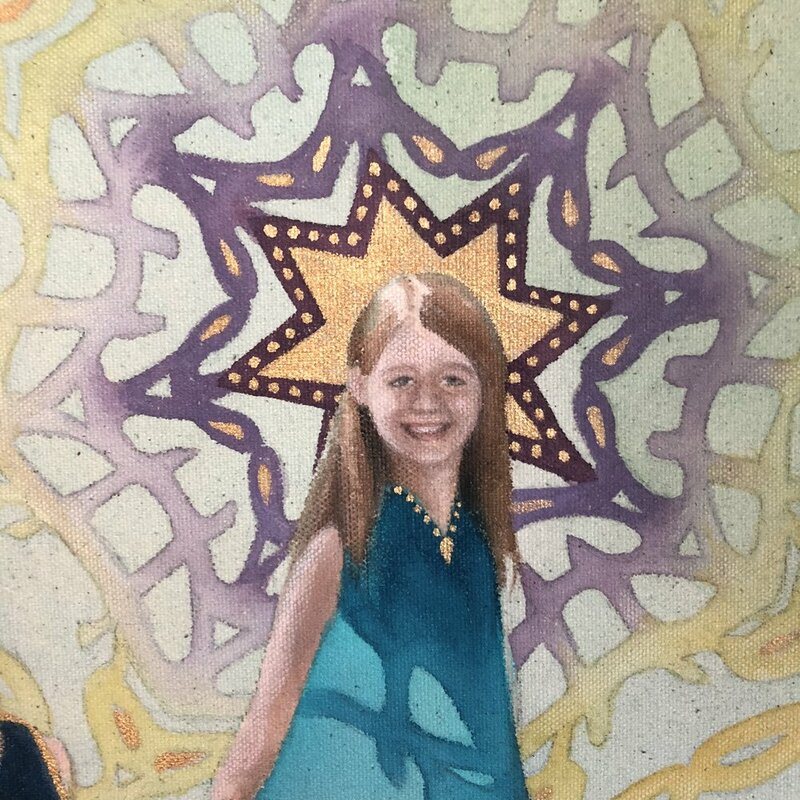 The person who commissioned me to do this painting asked me if I would make sure the designs weren't distracting from the faces. So instead of color, I chose to paint with gold to be used as a neutral inside the outer circle. I needed a color that wasn't too strong, yet one that would be dark enough so that the heads would stand out from it. I didn't want a distracting color, and I didn't want to clash with the colors I already had here. So many things to consider. I ended up layering many different colors of paint and pencil to achieve the color that I ended up with. I just kept going with one more layer until it felt right!